What is the key difference between the following two C functions? The first function, test_pressure(), converts the ADC reading to engineering units before making the threshold comparison. This is a direct, obvious way to implement such a function. The second function, test_pressure2(), converts the threshold value to an equivalent ADC reading, so that the two can be compared directly. The key difference is in performance. The first function requires that arithmetic be done on each reading before making the comparison. However, the calculations in the second function can all be performed at compile time, which means that the only run-time operation is the comparison itself. How many NAND gates would it take to implement the following translation table? There are five inputs and eight outputs. 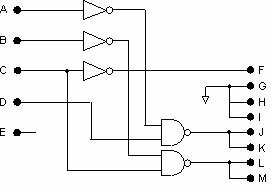 You may consider an inverter to be a one-input NAND gate. First of all, note that there are really only four inputs and three unique outputs for this function, since input E is always 1 and outputs GHI are always 0. The only real outputs are F, plus the groups JK and LM. The output F is simply the inversion of input C.
The output JK is high only when A is high or D is low. The output LM is high except when B is low and C is high. Quick history quiz: Who were the three companies who collaborated to create the initial standard for the Ethernet LAN? What was the name of the wireless network protocol on which Ethernet was based? Where was it developed?